The bold new features of the Ford Raptor help it stand out from the traditional off-road trucks of the past. Ford engineers have designed the 2017 Raptor with a different approach that contributes to its unprecedented performance features. While the new Raptor shares some of the same characteristics as the widely-popular Ford F-150 4×4, the Raptor comes in at a fully-loaded base MSRP of $48,860. Even though this may seem like a steep starting price, the entry-level 2017 Ford Raptor is seriously quick and was truly built to defy physics. The only true downfall of the Raptor is its size. This full-size truck was constructed with an extra-wide frame, which can be a hassle when navigating through tight city streets. The limo-like truck measures more than 19 feet long, while it is also 6.4 inches broader than a traditional Ford F-150. Additionally, because of its size, the Raptor features a longer than average stopping distance on paved surfaces. At first glance, the 2017 Ford Raptor appears to be bold and intimidating with its oversized frame, commanding signature front grille and custom beadlock-capable wheels. For the 2017 model year, the Raptor is now available in a SuperCrew model, which means more doors and more room. The distinctive and aggressive Raptor look is enhanced by its giant front skid plate, heavy-duty aluminum side steps, muscular haunches and a greatly-improved rear departure angle that gives the Raptor the ability to effortlessly transition from flat ground to steep and rugged terrain. From the rear, the new Raptor boasts two huge bazooka-sized exhaust pipes that are remarkably functional. Traditionally, when a truck has dual exhaust pipes they come directly from one muffler unit and split into two at the end of the truck. The new Raptor has two separate exhaust units that are both exclusively linked to the engine, which greatly improves acceleration and overall efficiency. While the exterior of the 2017 Raptor is aggressive and bold, the interior is surprisingly refined and offers a wide array of comfortable amenities. This 5-passenger, 4-door pickup offers 136 cubic feet of passenger space and plenty of room to spread out in the back seats. Soft-touch materials and tailored leather stitching are just a couple of the upscale features that can be found within the cabin of the new Raptor. Even better, an available Interior Color Accent Package (bright orange seat accents, electric orange color splashes on the doors and aluminum trim around the dash), contoured steering wheel and sporty paddle shifters give the Raptor an athletic feel. 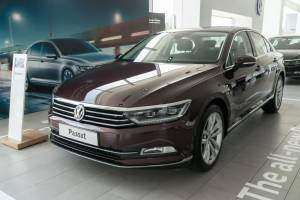 Some of the standard features include a 4.2″ driver information display, an 8″ central display touchscreen, 10-way adjustable heated and ventilated front seats, Bluetooth and Wi-Fi connectivity, Sync 3 infotainment with navigation system, an upgraded six-speaker sound system, dual-zone automatic climate control system, a tilt-and-telescopic steering wheel and easy-to-clean vinyl flooring. A large panoramic sunroof is also available for an extra $1,295. 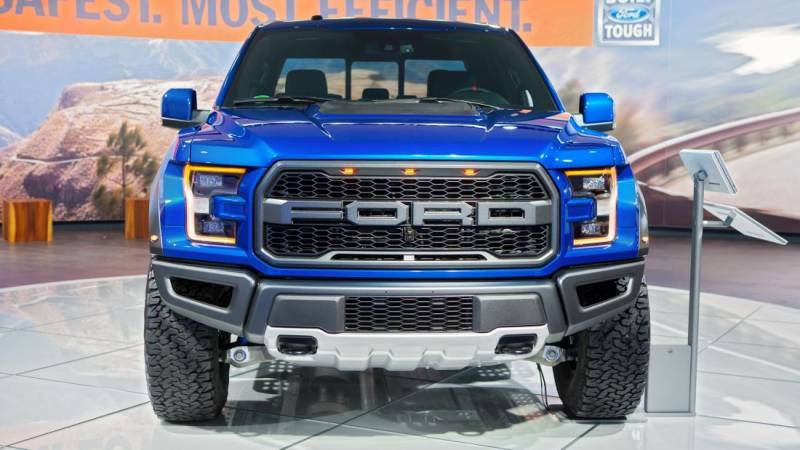 Ford engineers designed the Raptor with a high-strength, military-grade aluminum body and a high-strength steel frame. This tough and durable design was built to keep occupants safe in the event of a collision while also being able to handle some of the most demanding terrain on the planet. In fact, the 2017 Raptor was tested vigorously within the extreme terrain of the Mojave Desert. In addition to being able to withstand the elements, the frame of the new Raptor is 500 pounds lighter than the previous generation, which enhances acceleration, improves fuel efficiency and contributes to a fun-to-drive experience. 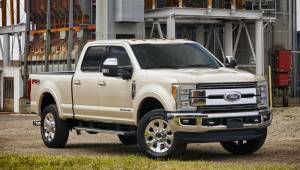 However, when compared to a regular Ford F-150, the Raptor still outweighs it by about 450 pounds. Under the hood, the 2017 Ford Raptor comes loaded with a powerful and efficient 3.5-liter 24-valve twin-turbo and intercooled DOHC V-6 engine that produces 450 horsepower and 510 lb-ft of torque. When properly equipped, this powerful engine helps the Raptor tow up to 8,000 pounds, making it the ideal truck for hauling equipment. This is the second generation of Ford’s 3.5-liter EcoBoost engine that first debuted back in 2011. This unique engine offers port and direct fuel injection, which helps it achieve up to 18 miles per gallon. When paired with its all-new 10-speed automatic transmission, the 2017 Ford Raptor can sprint from zero to 60 miles per hour in just 5.1 seconds. The new Raptor delivers a top speed of 108 miles per hour, which is impressive for a truck of this size. With a remarkable six different drive modes, the Raptor was designed to tackle a variety of terrain and weather conditions. Drive modes include Normal, Sport, Weather, Mud/Sand, Baja and Rock Crawl. While driving on pavement, the Normal mode is the optimal choice because it activates the innovative stop-start fuel saver technology. For added performance, the Sport mode creates a sharper throttle response, rises shift points and firms up the electric-assist steering system. When driving through snow or icy conditions, the Weather drive mode will provide the most traction for a safe ride. For a truly exceptional off-road experience Mud/Sand, Baja and Rock Crawl offer a unique blend between form and function. When driving over mountain roads or across sandy back roads, the Raptor provides an ideal amount of traction and stability with its off-road tires. Thanks to the all-new 315/70R17 BF Goodrich All-Terrain tires, the Raptor can deliver maximum performance both on the road and on the trail without sacrificing comfort. A brand-new tread design offers excellent grip. For even more traction when driving off-road, Ford recommends reducing the tire pressure when towering through sand dunes and coasting down winding mountain roads. In addition to the unique drive modes, bold new tires and a powerful new engine, the 2017 Ford Raptor has been outfitted with the latest off-road technology to enhance its trail-riding capability. New Fox Racing Shocks provide three-inch internal-bypass units to effectively absorb high-speed off-road hits while its 13.0 inches of front travel and 13.9 inches of rear suspension travel adds more cushioning to the second-generation Raptor. The advanced four-wheel drive system and locking rear differential provide the optimal feel for an enjoyable off-road excursion. Furthermore, its extra-wide stance offers more stability than ever before while its soft suspension system is able to help the driver maintain control when the Raptor is plowing through rough terrain at high speeds.